Still being in the new part of this year and all, I thought it would be appropriate to put together a action list for those wanting to improve their financial situation in 2019 and beyond. The reality is that if you don’t take action now, you likely won’t take action later. Remember: building wealth in order to achieve Financial Independence is the direct result of simple disciplined steps made consistently over time. Notice that these are not “goals,” but rather a punch list of 19 EASY ACTION steps you can take to ensure that your financial house is built on a solid foundation. To make it super easy, I challenge you to choose at least 12 items; you can take just one action a month through the end of the year. And guess what? Most action items on the list will take you no more than an hour to complete. That is 4% of your day or just 0.14% of your month. You can spare that kind of time, right? For the super ambitious, I challenge you to knock out all 19 items. You might even have a head start if you have already taken action on some of these items prior to reading this post. If that’s you, give yourself a pat on the back and find another item to knock off the list. There is so much POWER and TRUTH to this quote. Tracking allows you to establish a baseline from which to improve (we all have to start somewhere). This is super important because you need to know where you are, and where you’ve been, to figure out the best path to where you want to go. Building wealth is a numbers game and you have to keep score. Do you want to be a millionaire? Of course you do! I personally want to be a millionaire several times over. And guess what I’m doing that you should be doing? Yes, you need to track all of your financial accounts. You need to track your income. You need to track your spending. You need to track your assets. You need to track your liabilities. You need to track your investments. Track, track, track. Does that sound laborious? It’s the only way. I have good news for you. Tracking has become a lot easier with advancements in technology. And the best tool that I’ve found to automate my tracking is Personal Capital (which is FREE). Below is a screenshot from my personal account, where I have aggregated over 20+ financial accounts. My net worth has grown 2,287% since I started tracking it! Personal Capital allows you to aggregate your entire financial life into one easy to manage financial dashboard. All you need to do to see all your accounts in one place is log into Personal Capital and voila! But it doesn’t stop there. PC will even automatically classify all your income and expenses for you. You get a FREE and fully AUTOMATED tracking system. Are you leaving money on the table? At the very least you should be contributing enough to get the full match that your employer offers. If your employer provides a match of up to 6% of your income, you should be contributing at least 6%. So, if you are reading this and your contributions are set at 3% of your pay, leave right now and go increase that to 6% (seriously, do it NOW). Even if your company only matches 50% of every dollar you contribute, that is a 50% guaranteed return, something you will not find in any investment that exists on earth (or in the whole universe, for that matter). To that, I say, good on you! And…that there is still much work to be done here. If you’re already taking advantage of the full match that your employer offers, then you need to level up and work towards maxing out that 401K. The contribution limit is $19,000/year (in 2019). I encourage every reader of this blog to aim towards maxing our your 401K as soon as humanly possible. The earlier you do this, the easier it becomes. I often recommend to recent college graduates that they do this as soon as starting their first job. If you are a recent grad, the reality is that you’re likely earning way more money than you were while going to school. Maintain that student lifestyle a bit longer, develop this habit early, and get some real traction in place. It is something that your net worth will thank you for later. Look, the average starting salary for the class of 2018 is $50,390, so maxing out your 401K would mean contributing 37.7% of your income, leaving you with $31,390 before taxes. You’re probably only going to pay about 15% in taxes (if you live in CA; less in other states across the USA). That still leaves you with $26,682 in living expenses or about $2,323/month. I personally lived on only $1,000/month while in college, so this represents a huge lifestyle upgrade. Depending on where you are in life, you may be maxing out your 401K already, and you may have some additional funds that you’re ready to invest elsewhere. Look, I’m not even telling you to fund the account right away. In this step, you’re just opening up a brokerage account (baby steps). They have what I believe to be the BEST retail investing platform in the world. It’s so easy to use. They have over 100 ETFs that you can invest in for $0 Commission (yep, that is FREE). Oh, and 32 of those ETFs that are commission free are part of the Vanguard family (those funds with the lowest fees that all the PF bloggers rave about online). There is a ton of FREE education provided. Bonus Points: Set up a monthly auto deposit. In 2019, I plan to have $1,000/month sent to my after-tax TD Ameritrade account. Are you leaving more FREE money on the table? Why not get paid for the spending that you’re already going to do anyway? In late 2016, I signed up for the Chase Sapphire Reserve, which earned me almost $7,000 in cash back. If you include the other credit cards I’ve churned over the past two years, I’ve earned close to $20,000 (not too shabby if you ask me). This is real money! Why not get paid for the money you were going to spend regardless? And they say there is no such thing as a free lunch. WARNING: Only do this if you can afford to NEVER carry a balance. If you can’t pay off the balance every month, a credit card is not for you, regardless of the reward. Think you don’t have any room in your budget to invest? Think again! Earning credit card cash-back rewards on expenditures you were going to make anyway could offer up a significant amount of possible investing dollars. You can fund that brokerage account you opened in #3 above with this money. This could even fund a nice vacation as a reward for maxing out your 401K. To be honest, the GYFG household has paid for most of our family vacations with the cash back we have earned from credit cards since 2015. We covered this one a little bit in number #2 since your 401K contributions typically come out of your pay automatically every pay period. But there are plenty of other things you can automate in your financial life. Automate your credit card payments, by setting them to auto-pay (i.e., set your payment to “pay the statement in full” every month). Automate your monthly mortgage payment. Automate all of your recurring monthly payments, using the bill pay feature offered by your bank. Automate transfers to investment accounts (like the one you opened up in #3 above). Automate the tracking by opening up a FREE account with Personal Capital. Automate, Automate, Automate!!! Make one decision now instead of multiple decisions every month. There have been studies done that show that people who ask for more money make more money! You might be thinking, “But I just got a 3% raise, How can I go ask for more money?” If you’re reading this blog, you’re likely an overachiever, which in my opinion means you have likely provided more than enough value over the course of the last year to demand a raise that is substantially higher than 3%, which is virtually only a cost of living adjustment (2.2% for 2018, according to Social Security Trustees). And if you truly feel uncomfortable about this, ask yourself if you are in fact adding value to the company you work for above and beyond what is expected, and what others are doing. If you cannot answer “yes” confidently, find a way to do so. Be prepared to walk your employer through why you have earned the raise you are asking for and show up armed with specific examples of the value you have added to the organization. For example, a few years back I found $500,000 that the company I was working for at the time was double charged for over a three year period. It wasn’t on anyone’s radar, the business had no clue, and getting the money was a huge windfall that was greatly appreciated. This made it easy to ask for and justify a 10% raise after only five months with the company (at that time in my career, only $10,000). It’s a pretty easy sell when you say I just made you enough money to pay for this new raise for the next 50 years. Don’t settle for 3% raises! Trust me, I practice what I preach, which is why I have increased my income by $250,000 since 2015. Bonus Resource: Starting your career off with or switching over to a higher paying job can net you well over $10K over the course of a year. Not to mention the compounding effects of a higher salary year after year for your entire career. The best way to get a higher paying job is by using Pathrise. Their program provides young professionals and recent grads one-to-one coaching and tools to get a better, higher paying role. They have increased their fellows annual salary by $12K on average. Think of Pathrise as a career accelerator. And it’s free until you’re hired. RELATED: You CAN Get Rich Working for Someone Else Because Your Career Is Worth Millions of Dollars! This book, more than any other, has made a HUGE impact in my life. I have probably given away at least 25 physical copies of this book, and have recommended it over 100 times in person (thousands more via this blog). Do yourself a favor and buy a copy for yourself here . Then implement its strategy. Even if you only do this in one area of your life, at the end of 2019, you will have created a powerful trajectory of potentially life-long positive effects. Do you like paying less than face value for the money you were already going to spend? Of course you do! If you’re already going to spend money at a particular place (restaurant, retail store, grocery store, etc), why not get a discount? About three years ago, we found Raise, an online marketplace for purchasing discounted gift cards. As you may know from reading our monthly financial reports, we spend a lot of money on eating out, so we regularly buy discounted gift cards to the restaurants we either already frequent or ones we know we will soon. We tend to find gift cards marked down by 10-20% to the places where we were already going to spend money anyway. In 2017 we picked up $7,000 worth of Lowe’s gift cards for about $6,300 for a home improvement project (we laid wood tile throughout the entire first floor of our home). That’s a savings of $700, or 10%. It’s likely you have places you frequent, so why not get a discount on all your future purchases there by purchasing discounted gift cards? There are thousands of vendors to choose from. Check out Raise to save some money. Your credit score plays an important role when it comes to obtaining the financing you need throughout your financial life. Almost all of us will need a mortgage at some point and time. You also need a solid credit score to get approved for credit cards (the only way to get those lucrative signup bonuses and cash back programs mentioned in #4 above). These days you can check and monitor your credit score for free. Free Identity Theft Protection – you’re protected with up to $50,000 for FREE. It only takes 90 seconds to sign up for a FREE account. How can you pass up the free $50,000 identity theft protection alone for that minimal time outlay??? I assume that if you’re reading this blog you already have cash set aside in case of an emergency. My bet is for most of you that cash is sitting idle earning something very close to 0%. Step one: transfer that cash to an account that is going to pay you the highest yield while your money patiently sits around waiting with bated breath for an emergency. In the best case scenario, that emergency never comes and your idle cash makes some friends (in the form of interest earned). In the worst case scenario, your idle cash makes some friends until those soldiers get called to active duty (an emergency). Step two: start building an “opportunity fund” that is an amount incremental to your emergency cash stash. We have all witnessed how volatile the market has been lately with the major indices correcting by 20%+ from their all-time-highs. In times of uncertainty, cash is KING. Those with cash can take advantage of the bargains. Build your cash war chest strategically with a CIT Savings Builder Account, which pays 27X the national average for GYFG readers (CIT currently pays 2.45% – see banner below; the national average according to Bank Rate is 0.09%). And you only need $100 to open an account. If you’re going to have cash sitting around you might as well earn the highest interest rate you can. Based on my research, the CIT Savings Builder Account is currently the highest paying savings account on the market. Note: You will need this Toolkit for the next few action items. Ever tried to physically build something? Ever tried to build something with a screwdriver, and then been handed a power drill to get the same job done? Your efforts become stressless, and your output optimizes geometrically. The wrong tools might still get the job done (maybe), but it takes a lot more time, and a lot more struggle than using the right ones! Building your financial independence is at least as hard as building a physical project: lots of moving parts, lots of factors to keep track of (helps reinforce action item #1 to track). I love an elegant spreadsheet. I use them for everything. Over my wealth-building journey, I have created some pretty epic spreadsheets to help me manage my finances. I’m happy to hand you the “power drills” of your own Financial Independence, a full toolkit of my finest instruments, FREE, just for hanging around the GYFG community. It’s everything a Freedom Fighter like you needs to build the most excellent treehouse of wealth! I’ve shared long ago that the GYFG household aims to save 50% of our after-tax income. This is not a target that happened overnight. It took intentional planning and discipline. This is the “law of 50/50,” which states that you invest 50% of your after-tax income and spend the remaining 50% guilt free. It’s a very balanced approach. It’s also a free pass to lifestyle inflation. I want you to calculate your savings rate in order to get a benchmark of where you’re starting from. Again, you have to know where you are before you can get to where you want to go. I’ve made it very easy to calculate with the “Savings Rate Calculator” in the above Toolkit. Depending on where you are starting from, it may take you a few years to get to 50% but don’t let that stop you from pursuing this goal. Why 50%? I recommend 50% because this is the savings rate that will allow you to reach Financial Independence in 10-15 years. I’ve provided you with a budget template in the download from #11 above. I encourage you to first read the post I wrote on the two different approaches to budgeting: Control-Based vs. Allocation-Based Budgeting. Then decide what the right approach for you is based on where you are in your financial journey. My recommendation is that if you are not yet to the point of saving 50% of your after-tax income that you start with the Control-Based approach that I outline in the above link. Preparing a budget (and reviewing it regularly) is going to keep you in a money-conscious state of mind. Remember: it will take intentional planning and discipline to make your way to 50%. When you download the Toolkit you will also notice that I built in a monthly savings rate calculation, so it gives you forward-looking visibility as to where you’re headed if you stick within the confines of the budget. Money can be very slippery, in that it is very easy to spend. Therefore, I recommend that once you develop your budget, you revisit #5 above (“automate everything”) and also automate savings in order to ensure you pay yourself first. Put together a plan to eliminate all the debt in your life. You need to unshackle yourself from all consumer debt. (a) Pay off your credit cards (in full and then never carry a balance ever again). This is priority #1! (b) Pay off those pesky student loans. Refinance in order to consolidate and lower your interest rate. Then take the advice from #5 above, automate your payments, and set a pay-off date goal. Maybe you increase your payment to get them paid off sooner. (c) Look into refinancing your mortgage to take advantage of a lower rate (although rates have risen, they are still low historically speaking). Then take the difference and start paying down the principal at an accelerated rate. The GYFG household is on track to be mortgage free by July of 2019. Are you ready to start putting some of that Opportunity Fund to work? Maybe you are maxing your 401K and are now ready to diversify into another asset class like Real Estate. You might not be ready to invest in the physical stuff all by yourself because you aren’t ready to be a landlord or maybe you don’t have enough funds. Or maybe you’re just looking for a completely passive way to obtain exposure to Real Estate. I personally like investing in Real Estate through crowdfunding platforms because they allow me to invest in smaller increments, maintain diversification, and be of passive nature in this arena. With Rich Uncles, you gain access to Commercial Real Estate across the USA. You can invest as little as $500 to get started (you can also invest as little as $5 if you start with their student housing fund). Nor do you have to be an accredited investor. I’ve personally been investing with Rich Uncles since 2015. My current investment is sitting around $65,000 as I type this. Presently they have one fund that invests in Commercial Real Estate and a newer fund that invest in Student Housing. You are investing in the equity portion of the capital stack. Most of my funds are currently invested in the Commercial NNN REIT. I really like the investment approach and filter here. In short, they only invest with a max of 50% debt, and all properties are triple net with average lease terms of 10+ years (with Fortune 500 companies as tenants). This particular fund also pays a 7% annual dividend with monthly payments. PeerStreet, on the other hand, is only available to the accredited investor (for now). This platform has opened up the hard money lending space to the retail investor. I started investing in short term hard money loans back in early 2017. Today I have about $105,000 invested across about 52 loans. Unlike Rich Uncles, you are investing in the debt portion of the equity stack. To be more specific, your investment is backed by first position senior debt, which is the safest part of the capital stack, because investors in first position are the first in line to get paid back (whether due to a sale, refinance, or default). I personally have my investment filter set to only invest in loans that have a max LTV of 60% and a minimum interest rate of 8%. The average LTV across my portfolio is around 63% with an average interest rate of 7.5% (I used to allow a higher LTV when I first started). I have met with the management of both companies and was really impressed by the teams behind both these platforms. This is a great place to get started in Real Estate if you want to dip your toes in and diversify your asset allocation. I’ve already provided you with your first book recommendation in #7 above – The Slight Edge . This first book will instill in you a philosophy of constant and never-ending improvement. I love The Slight Edge so much because it is a book about the power of compounding in all aspects of your life, not just the financial part. It arms you with a standard operating system. Now it’s time to continue expanding your knowledge base and finding ideas and systems to expand on this philosophy. 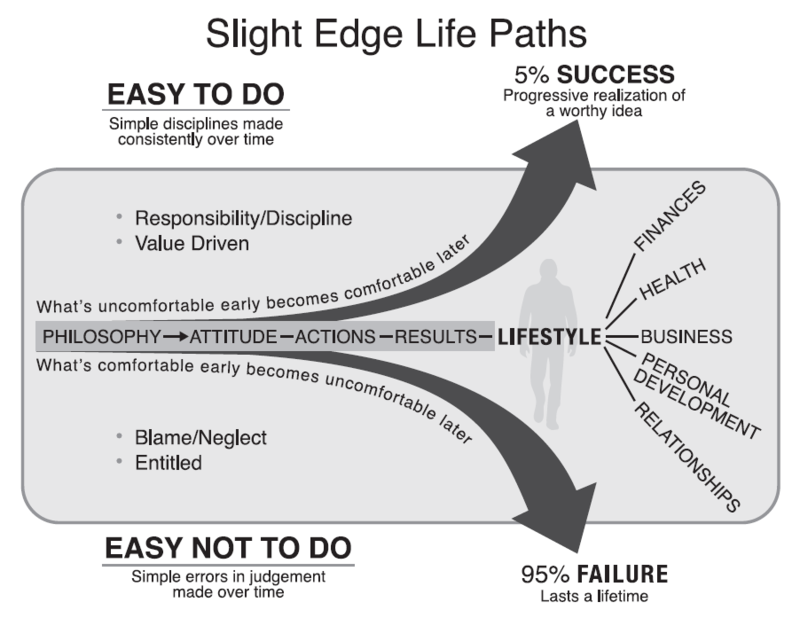 Think of The Slight Edge as an iPhone and new knowledge as apps that expand the usefulness of that iPhone – killer apps. Aim to read ten pages a day. You can certainly do that. Let’s assume that the average amount of words per page is 300 and that the average person can read 200 words per minute. We’re talking about 15 minutes a day of reading. That’s only 1% of your day! Pro Tip: Really no time to read? Check out audio books with Audible . Really pressed for time? Then check out Blinkist, which provides you with 20 minute executive summaries in audio form with the top ideas and takeaways from the book. You will get at least 10X your investment of running a blog! I began the Gen Y Finance Guy blog just wanting to get my thoughts organized, to become a better writer, and to shape my opinions into some kind of structure. I’m no writer, believe me, but I wanted to improve. Plus, people I had read about and admired said over and over how powerful writing is to improve as a person. I’ve always been interested in money, so I decided to write about that. But something funny happened on the way to my “personal improvement.” As I wrote out my goals, published my monthly net worth transparently, and stated my savings target…I started achieving. Big time. Putting myself out there in public delivered back in a huge way. Tangible ways. My income has crossed the “Top 1%” in the USA. We are actually eleven years ahead of schedule in income as per the “big hairy audacious goal” I originally set! Our household has achieved beyond the savings rate we aimed at. In 2018 alone, I have deployed more than $400,000 in capital towards our goals. I want the same for you! Maybe you don’t consider yourself a writer. Maybe the thought of airing the “dirty laundry” of your current financial situation (debt? investments gone bust? ignorance? starting late? chaos?) makes you really uncomfortable. But the magic happens when you step outside of your comfort zone. Maybe you think you don’t have the time, or you just can’t see the connection. But I’m here to tell you that all of that will straighten out: put your fingers on the keyboard and start typing. Thoughts to fingers to page to publish, even if not one other person reads at first, begins a process, a powerful process, of refining what you want and what you think. When you hit “publish,” you are hammering a stake in new terrain: your terrain, where you will live life by your own design. My promise from the beginning has been to never promote anything I myself have not first done and had success with. I am the guinea pig. I will never break that promise. So when I say start your own blog, like I did, I’m only telling you to do what has truly worked for me. Your unique voice is unlike that of anyone else. You have your own combination of life that led you to this point, and someone else will be enriched to read your story. Work at it enough, and you could monetize a blog beyond your wildest dreams. Most importantly – and even if not one single other person finds you – starting your own blog makes you set goals, holds you accountable, and provides a matrix of measurement day after day, month after month, year after year. Post by post, you will lay out the next handhold to reach for, and you’ll then grow enough to reach it. Unlike the risky winged unicorn of a potential ten bagger stock investment, this 10X proposition bears a financial risk less than the price of a night at the movies with popcorn and drinks, or a dinner out for two. You want to join the ranks of high achievers? Hire a $20,000 performance coach, take a $5,000 one day workshop, lay down on a $250 per hour psychologist’s couch. Or…start a blog! Are you willing to 10X your life? Do it! Let me be your first subscriber! BONUS: I’ve already created a guide that will get you up and running typing in about 20 minutes or less. Check out my “Start a Blog” guide. (A) Create an Emergency Fund and working towards saving six months worth of living expenses. (B) Set up a Trust that includes a will. (C) Consider diversifying your risk by investing in a non-correlated asset like life settlements. (D) Choose a meaningful place to donate, and automate that. We sponsor a little boy in Africa for $100/month, which to us is a very small amount, but which pays for his schooling and room and board. (E) Consider a Health Savings Account, if you qualify. This is often called a “stealth IRA,” with 2019 limits of $3500 for single, or $7000 family, for another place to stash pre-tax dollars. The possibilities are endless and likely unique to your own financial goals and current financial situation. These are just some ideas that have worked for me. A lot of the items on this list are universal and others you will have to evaluate to see whether they make sense in the context of your own financial goals. Create a solid (which is to say, automatic and boring) foundation from which to try some more creative and aggressive ideas later. I wish you a very prosperous and fulfilling 2019! I enjoyed reading your blog. You are quite inspiring to me. Thank you for sharing your knowledge. It’s most generous of you to do so. I am looking forward to you reading my blog sometime in the near future. I also agree with you about reading. It has created in me a metamorphosis, from complete ignorance, to knowledgeable financial literate. Action being my most beneficial result. Looking forward to your future blog, and mine. What is your blog? I would love to check it out.